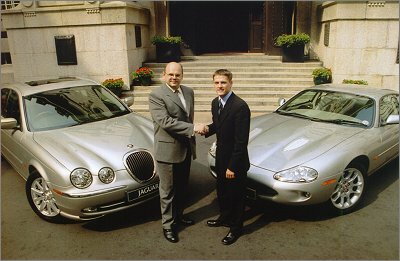 Michael Owen, Englands World Cup soccer hero, has entered into a three year, world wide marketing agreement with Jaguar Cars Ltd of Coventry. Effective immediately, Jaguar is the exclusive supplier of motor vehicles to the 19 year old Liverpool star striker. Under the terms of the agreement, Michael, who has been evaluating a Jaguar XK8 coupe over the past few months, has now opted for its supercharged brother, the XKR coupe, together with a new Jaguar S-TYPE sports saloon. In anticipation of his new cars, Michael recently undertook Jaguars Advanced Driving Programme, which is designed to enhance road craft by improving driver awareness, observation and control. The programme is carried out by qualified experienced instructors and is available to all Jaguar customers. "For me, Jaguars represent the best of British. They are stylish, prestigious, refined and great fun to drive. Also, with Jaguar planning to build a new smaller car at Halewood on Merseyside, the local connection was very important to me, as many of our supporters work there. Its a great time to be flying the flag on Merseyside." "Like England captain Alan Shearer and tennis star Greg Rusedski, who also drive Jaguars, Michael represents the young, dynamic, successful customers who increasingly are attracted to the Jaguar marque. They match perfectly our ongoing strategy of broadening the appeal of our product range."